So, my year of the Rooster has ended. As it turns out, I actually wrote my first birthday post on the year of Rooster, so this is my second cycle now. I find it interesting that I was led to write my birthday post because of a discussion I once had with a friend. So, I decided to write about it and somehow, it’s become a tradition for me, which is something I intend to keep. Kinda like having a diary. I was once asked by a KAD, which is short for Korean American Adoptee. After doing some research of my own and my personal experience, I was led to write this particular snippet, which I realize is pretty special in its own way. There are four stages that most Korean adoptees tend to go through. First question was asking whether they were really born in Korea or not. After that, second question was to ask why they were adopted and the reason behind that. Third question is whether they can reunite with their family, meet siblings if any and learn more about their history and culture. Fourth and final question is whether they can accept this identity and carry it with them for the rest of their life as well as maintain relationships with their family if both parties desired. I can say I’ve gone into the 4th stage and still keep in touch with my birth family. I tend to keep this identity as something unique. This is the only thing I know and how I am different from others. It’s interesting how things unfold, because at the beginning, I wasn’t really looking for my birth family in South Korea and that it happened rather fateful. I’ve written how the girl and I met in college, who ended up being the one that helped me find my birth family. We just happened to be in the common studying area by the hall, with a round TV, and was mostly used for doing homework or discussion with students. I remember I was doing my art project and needed a big table to work on. There was the girl who was just reading through textbooks, mostly likely how to learn English. That’s because she’s an international student and had come from South Korea to study English as the second language in Rochester, NY. This was something I noticed at the start. I waited, and saw her again. At that time, I was watching the Summer Olympics being held in Sydney, Australia. The round TV was showing a women’s volleyball game between Australia and South Korea. As I was watching the game on TV, the girl turned her head to the TV and kept watching. That gave me all the clue I needed. She’s a Korean. I took up courage and finally stepped forward and introduced myself. Well, happy birthday to me and to the second cycle of Chinese Zodiac. This year marks 12th year since I wrote my first birthday post. So, I’ve completed third cycle based on the Chinese calendar. Perhaps it was in my own subconscious that I was inspired to write my first birthday post because I realize it’d be the rooster sign that year and to my own surprise, I kept up with my birthday writing and here I am, 36 years old, in my third cycle of the Chinese calendar. As you know, Lunar New Year doesn’t happen on the first day of the new year (Jan. 1) but later in the year, on January 28th. Know who has a birthday on the same day? It’s my mom’s birthday. :) All sorts of different connections there. So, today, I turn thirty-six years old. Or 36 times around the Sun. This time, I’m closer to the 40 years old mark than I am towards 30 years old. It has that feeling of running more than halfway to the first mile on your daily treadmill run. Since average life expectancy is around 77 years old for men, 40 years is like middle age, so I’m quickly reaching that halfway point. I am a believer of the law of averages, so I expect to be deceased by the age of 80. Anything longer than that would be considered bonus to me. That’s how I shall look at my life, the scarcity of it, not that there’s anything despair about it, just how life is. INTERVIEWER: You can’t have a detective unless something’s missing. INTERVIEWER: In the course of trying to come home. MURAKAMI: He has to survive those experiences, and in the end he finds what he was searching for. But he is not sure it’s the same thing. I think that’s the motif of my books. Where do those things come from? I don’t know. It fits me. It’s the driving power of my stories: missing and searching and finding. And disappointment, a kind of new awareness of the world. After reading that excerpt, I’ve finally found my own answer, in that I was like Odysseus trying to find his way home and to be reunited back with his family but of course, the gods kept messing around with him and one certain goddess who had taken a liking to him. After discovering my family in 2002 and having met several more, I feel like my own identity has grown more firmly, knowing where I came from and how I’ve gotten at this point, almost like how a star is born. Whenever people got curious about my adoption and asked why I’d want to find my birth family in Korea, it can be pretty difficult to give an answer but this Odysseus experience sums it up well for which I can give as an answer, given if they’d know about the story of Odysseus and the Virgil. INTERVIEWER: Disappointment as a rite of passage? MURAKAMI: That’s right. Experience itself is meaning. The protagonist has changed in the course of his experiences—-that’s the main thing. Not what he found, but how he changed. I agree completely with this, that when I visited South Korea for the first time ever, it was the experience that gave me a sense of meaning, rather than what I found. I suppose it was a good thing I was able to keep an open mind, not expecting South Korea to be exactly the same as the U.S. was, or any country for that matter. It’s just what it is, and like everybody else, everyone has their own shortcomings. With that said, I believe I was given up for a reason, and that’s all it matters. The rest of it, is utterly up to me and how shall I want to spend my life. If you’ve kept up with my posts, you probably could tell I’m a big fan of Murakami. It was from reading his books that I’ve come to the sense of myself, and whatever thoughts I may have in my mind is not all that weird. Like a true fan who wants to bid on lunch auction (worth $1 million or more) with the billionaire Warren Buffett or to shoot a round of golf with Tiger Woods himself, I’d love to run a 10k with Haruki Murakami and have a beer afterwards and discuss on the finer things in life and women. I can only hope I can persuade him to a glass of Sierra Nevada Pale ale, my favorite beer. My blog has turned into another year for 11th time. So am I, into 35 years old. Recently, Asian countries celebrated Lunar New Year this early month and it’s the monkey’s turn too. Know what’s next? Rooster? which is my animal sign! 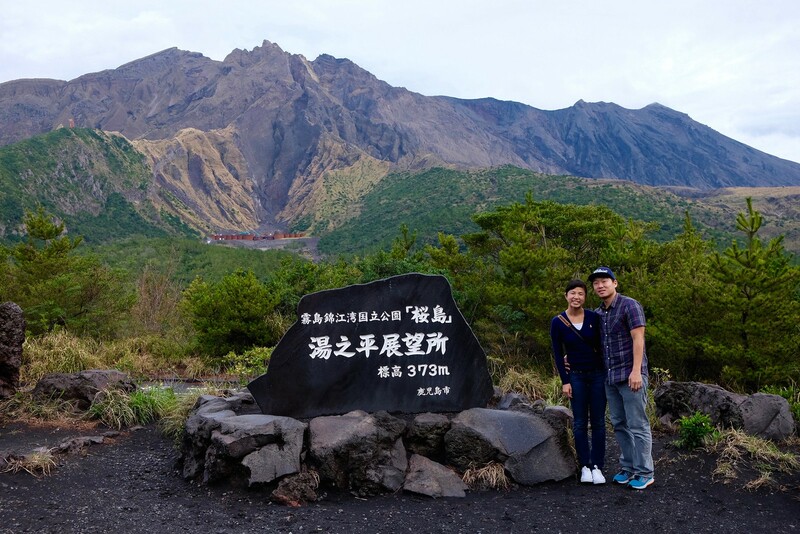 Yuka and I recently celebrated our first year, getting married on Sept. 20th, 2014. Most of the time, we spent either working or traveling to somewhere new, like the one we went to Chico, CA where it’s home to my favorite beer, Sierra Nevada Pale Ale. That was fun and sampled lots of beers and got pretty drunk in the process. Then, we stayed at a campground nearby, in our tent, costing $20. We had like four friends’ weddings and went to each. I had a chance to re-visit Washington, DC where I spent 3 years working there and got my start with Google as a datacenter technician. So, that was fun to go back and it’s definitely more populated this time than the last time I was there. I had fond memories with DC, home to Gallaudet University. I also spent time playing golf and disc golf. It’s a good exercise and it’s something that you can’t rush your game like playing football or basketball. I do some running to stay in shape, which is surprisingly effective. You don’t have to be the fastest man on Earth but just give yourself a chance to work your body through running. That’s pretty much all you need. I do pushups too and occasionally go to gym couple times a week. I think that’s how I will spend my life, doing fitness things. Well, I feel like 2015 really went by fast and this time, I have someone I spend my time with, which has been profound. It’s like my memories became more significant because there’s someone in it. I’ve also been reading books on my Kindle, and this year was a productive year on reading books. I’ve read more than 15 books and read all of Murakami’s books, which I should do a review of. I find a lot of things in common with Murakami, which makes me feel thankful and normal in an odd way. I shall share these feelings one day. Also, this year, I feel like I know more about myself. I’m not sure why but I feel like I know what I’m doing and what I have to do. It’s been mind-stimulating as if you are playing a chess against a good opponent. So, what I’ve done this year is doing what I can do, stay in shape, and keep reading books and have some conversations with different people I know. I should make new friends too. Tags: birthdays | got comments? I opened my black leather wallet and saw that I had one twenty dollar bill. Andrew Jackson’s big face. This guy had nice wavy hair, I’d say. Then, I got the bill out of my wallet and into my left pocket inside my pants. Why? Because I was going to do something I’ve never done in my life and I needed the twenty dollar bill. Where I was at, I was being at my friend’s wedding, having a chill time, especially after having consumed enough alcohol to put myself in a festive mood, and my cheeks were starting to glow red. Asian flush, you know. The open bar was quickly drawing to an end. It’s time for me to walk to the front and ask for another drink. Actually, multiple drinks. A young bartender saw me again and politely asked what I’d like this time. I said I’d like six glasses of Chardonnay wine and fill them high enough that the whole bottle would be emptied. The bartender shook his head, “Sorry, can’t do that, sir. One or two drinks per order, please.” I smiled and started reaching into my left pocket to fetch the twenty dollar bill. It was as if Andrew Jackson was waiting for me from there. I showed the bill to the bartender and said “See this twenty dolllar bill? Sorry for the accident I’m going to drop this into that glass bowl.” The glass bowl was right between him and I. It wasn’t even half full. You could see the young bartender’s eyes starting to widen. There was some pause, like he needed some time to consider things. Really, he didn’t need to. Finally, he said “Sure, it’s an open bar after all, almost time for the last round.” and proceed to pop the Chardonnay bottle. He did what I asked, pouring into six glasses and the wine bottle started to empty out, then spilled out for good. I dropped the twenty dollar bill into the glass bowl. From what I can see within that glass bowl, it had to be the biggest tip of the night. Because I can only see one Andrew Jackson in there. I called my wife and friends, telling them to get their drinks. They came, then I took a big sip, probably the biggest sip out of us six people. When I finished my sip, I looked back at the bartender, only to find out he was watching me, as to say “hope you’re having a great time.” He kept a polite face. “Good bartender” I thought. I grinned and walked away. He got his tip. I got my drink. Even though I have spent seven years in Seoul, it is not one of my favorite cities in the world. Actually, until the recent beautification projects, it was one of my least favorite. Seoul has too much concrete, too many people and too little traditional culture has been preserved. Yet, I consider Seoul my second hometown and yearn to be there whenever I am away for very long. It is the Korean people who keep me coming back. I first experienced jeong with my wife`s family. I was very close to my father-in-law, who passed away in 2002. As someone who fled North Korea during the Korean War, he took great interest in my work on North Korea. He once told me, “Of my six sons-in-law, you are my best hope for visiting my hometown and finding out what happened to my parents and siblings.” I still have not had a chance to visit Haeju, but I believe that I will someday. He also taught me that a son-in-law is a “one hundred-year guest.” He raised two ornery turkeys during one of my stays in Korea so that the whole family could have a traditional American Thanksgiving dinner. The second quality I admire in Koreans has been even more difficult to grasp. Euiri can literally be translated as “moral sense,” but is better understood as a combination of loyalty and integrity-two qualities often lacking in America`s capital. Former President Harry Truman once said, “If you want a friend in Washington, get a dog!” We have had a clear display of euiri in the passing of Presidents Kim Dae-jung and Roh Moo-hyun. The expressions of anguish on the faces of those who worked with and for them tell it all. In contrast, here in the U.S., former Bush administration officials have created a circular firing squad of blame for the Iraq fiasco and even Vice President Cheney has turned on his old boss. When you combine jeong and euiri and apply them to the three connections that bind Koreans together – namely blood, hometown and school ties – it leads to intense and powerful personal relationships. For non-Koreans, these relationships are impressive to observe, but they do not come without a price – the burden of responsibility and occasionally conflicting moral imperatives. For example, do you help a close friend even if it means breaking the law? Confucianism has shaped Koreans in many positive ways, but the characteristic I like most is the respect accorded to elders and teachers. If I had to point to the cultural underpinnings of Korea`s rapid economic growth, an age-based social order and the centrality of education would be at the top of the list. Teachers have a status in Korea that is unimaginable in most other countries. Of course, attitudes change and a growing number of younger people are challenging the traditional hierarchy, but it is a quality that remains vital. The tension between the traditional and the modern is part of what makes Koreans so fascinating. One of the Korean qualities that has not changed and I find most endearing is the hospitality and kindness I continually receive from total strangers. I was always getting lost during my first visit to Seoul, but people went out of their way to help me find my destination. Wandering around the countryside, I have been invited to join in 60th birthday celebrations and offered snacks on the hiking trail. Countless people have patiently explained to me the mysteries of Korea`s language and culture. How could one not appreciate such a people? A fifth quality I have both admired and tried to embrace is the Korean proclivity to work hard and play hard. I attribute this to the drive for accomplishment and a general thirst for life. The ability to work a 10- or 12- hour day and then go out eating and drinking is a skill not easily acquired. I know of no other country that offers “three days, no nights” tours, where you depart on a bus in the evening, then hike all day, and return home that night. The sixth quality I would like to mention is also the most esoteric. During my very first visit to Seoul, even in the midst of a concrete jungle, I was struck by the beauty of Korea`s people. My eyes were the first part of my body to become Korean. We all know that Bae Yong-jun spearheaded the “Korean Wave,” and Korea`s actresses and models have no rivals in my eyes when it comes to beauty. Many a foreign reporter visiting Pyongyang has commented on the attractive female traffic police. When I exclaimed to several Gaeseong factory workers, “the old saying is really true, `Southern men, Northern women (nam-nam buk-nyeo),`” I did not receive any response. Finally, I would be remiss if I did not mention the Korean preoccupation with eating and drinking. One of the first greetings I learned was, “Have you eaten?” and my very first Korean proverb was, “Even Diamond Mountain should be viewed after eating.” Eating is of course central to our existence, but Koreans do it with a relish that is almost unrivaled. In Japan, you are never far from a vending machine; in Korea, you are never far from 10 restaurants. I am still amazed when I go into a Korean barbecue restaurant, eat two or three portions of galbi, finish off several side dishes, only to hear the waitress ask, “What would you like for dinner?” (Shiksanunyo?). Korea has an equally intense drinking culture, which I have also tried to embrace without pickling my liver. I was introduced to this culture during my first summer in Korea in 1988. One of my teachers (Prof. Lee Young-hui) invited me to go hiking in Bukhan-san with several other dissidents (including Baek Nak-chung and Poet Ko Eun). I should have known from the enormous backpacks each was carrying, but on top of the mountain we had a huge meal and rice wine (makkoli)! One of the things that keeps most Koreans (and myself) from becoming an alcoholic is not drinking alone. I like the custom of never pouring for oneself so much that I impose it on non-Korean family and friends. When I got married, not only did my wife wear a hanbok, but we also followed the Korean custom of having the most prominent social figure in our lives, my graduate school advisor, conduct the ceremony rather than a religious person. A Korean professor attending described our ceremony as “Komerican.” I have taught my daughter to be proud that she is both Korean and American. She comes from two great peoples! Peter M. Beck is the Pantech fellow at Stanford University`s Asia-Pacific Research Center. – Ed. Tags: dad, thoughts, Writings | got comments? My earliest birth memory of Korea would be that of the orphanage where I stayed for about 8 months before I got adopted. I did remember it would get really cold during winter and that I often wore a thick coat or some sweaters and my nose would get wet, then my sweater would get wet too because I kept wiping off my nose. I remember I would play with kids and I liked playing with swings in the playground. I also remember the lady, a bomo, who would watch us while we slept and more than that, she would beat me with a newspaper rolled into a baton if I couldn’t fall asleep and I would stay down on the floor and watch her and the small fluorescent lamp that was alongside her. She always seemed to have books with her so I guess she was reading or studying, maybe for the college entrance examination and I’d ruin her concentration with my sleeplessness on many nights. Then I’d finally fall asleep. Another memory I had of the orphanage was how I’d notice some kids would become “missing” so to speak. Like I’d find some kids who didn’t mind playing with me since I couldn’t hear and I’d look out for those kids till they disappeared. Where did they go? I wondered. One time when I finally got big enough to be able to get up on the high balcony that was by the window, probably my favorite spot of the orphanage as I can pretty much see everything what’s out in the world. It was on a second floor. I saw a small white truck out there and almost every morning, the guy would park by the curb, get out of the truck, get around to the back and haul something out of it. Light white air (actually just a cold steam) would come out of the truck’s rear and I had no idea what the guy was doing. I thought that must be how kids disappeared, as the man got the kids and dumped them into there. I told myself I would stay away from the truck or hope not to get caught and be put away by that truck. When I visited Korea again in 2002, I saw the same kind of truck again….and it was just a delivery food truck. So much for my own imagination. Next and last memory I had in Korea was of the plane I was abroad on. I remember how everything was in a rush because my bomo was buttoning me up with everything, from my shoes to my coat, and put on a hat and I saw my clothes being folded into a suitcase and my bomo just kept grabbing my hand and pulling me around and I finally got into a car. My bomo had some tears on her face, knowing that she won’t be bothered again by my annoying presence. Then we got on the plane. I remember it was mostly red inside, lights off for most of the time and that it was a very long flight. The plane finally touched down on the ground and when I stepped out of the plane and walked down the tunnel, and at the end, my parents and I met for the first time ever. Tags: adoption, korea, memories | got comments? Since I’ve become a big fan of author Haruki Murakami and sometimes, he can go big on fantasies, so I’d browse around on the web and learn more about its themes and his writing style. I saw this article and thought it was a nice analysis of his writing style and the protagonist he tends to put in his books. Haruki Murakami resembles Mishima mainly by virtue of being Japanese, and after that the affinities get pretty tenuous. Mishima was one of literature’s great romantics, a tragedian with a heroic sensibility, an intellectual, an esthete, a man steeped in Western letters who toward the end of his life became a militant Japanese nationalist. Even when he’s writing about relatively fantastic subjects, like spirit possession in sheep, Haruki Murakami’s sensibility is that, I think, of a skeptical realist. His narrator is inevitably Everyman, contemporary Tokyo edition, a kind of thirtyish urban male in a low-key, white-collar job, like advertising or public relations, a somewhat passive fellow who doesn’t expect much out of life and who takes what comes to him with jaded equanimity. That sounds a lot like me. I go to work everyday, earn my paychecks. I try to work out daily and play golf. I have my beers at night, read some books, and dream of becoming a F1 driver or a Porsche 911 owner. Acura NSX too. Repeat thought cycle the next day and next that. I’d say that’s pretty mediocre life. Tags: murakami | got comments? “There are many opinions about that. One thing that’s for sure is that the universe itself is evolving. Putting aside the question of whether or not it’s some kind of trend or willful intervention, the universe is evolving, and in the end, we’re merely a small part of that.” I pushed away my glass of whiskey and lit a cigarette. Spinning the ice around in her glass with her fingertip, she stared at the white tablecloth. Tags: thoughts | got comments? Tags: Writings | got comments? Thirty-four and ten years anniversary! Today, I turned officially into thirty-four years old. 34. 34th time around the Sun. With that, it’s time to write another birthday post, which is something I’ve been doing since I turned 24 years old. That’s ten years ago! I still think blogging is nice, like writing your own diary, despite how everyone is on social media these days, but I believe emails and blogs still prevail. I read my first birthday post and it was brief. I had something to say about Chinese astrology, which if you had to guess someone’s age, all you have to do is ask what is their Chinese sign, then you’d be able to deduce which age s/he would be, as there are twelve signs, so 12 years margin in between. Also, I just realize New Lunar Year was last week on the 19th, so perhaps it makes sense that I’d write this annual post on my birthday since it happens soon after Lunar Day. I do know that China and Korea celebrate Lunar Year extensively. Not sure about Japan tho. It’s interesting to read through my birthday posts, like I dreamed about owning Honda S2000 one day which I did so a couple of years ago. I however sold the car so I could afford an engagement ring to propose to my wife, and ultimately, finance the wedding. Speaking of wedding, in less than a year, I got married to my wife. I didn’t even see it coming myself but it happened rather quickly and like they say, timing is everything. One day, I thought I’d never meet anyone or get married, or having all sorts of relationship problems, trust issues, then the next thing I knew, I met someone and got married. As I read through these birthday posts, I realize 10 years happened in an instant. So that means next 10 years will happen in an instant too. People say life is short. Indeed it’s true. Which brings up the topic of a bucket list. If you noticed, older people tend to say they have a bucket list. I’m noticing it myself that I’m slowly building one myself. There are things that I want to do, mostly around traveling to different places and do hiking. One is to see the volcanoes and lava flow in Big Island, Hawaii. I think Yuka and I might do that for our honeymoon vacation. Another one is climbing Mt. Kilimanjaro in Tanzania. Looks like I’ve got a thing about volcanoes because I recently climbed Mt. Fuji in Japan, which was one of the most fulfilling trips I’ve ever had in my life. Another short-term goal is to hike Mt. Whitney, the highest summit in California. Right now, Yuka and I are planning a road trip to Mt. Whistler and hope to snowboard if there’s any snow up there! So, between playing golf, driving fast, running, traveling/hiking pretty much comprise my outdoor life. The rest, computers and reading books take over. And I need to write more. Before I close this birthday post, one of the things I’ve been thinking often, like with our bucket lists, is our psychological state. Since our life is limited in finite numbers, it’s important to recognize and see where we are at in terms of life. Because if we don’t do that, we may lose sight on what’s important and we might find ourselves dissatisfied with life and paradoxically cut our life short. Every once in a while, I’d read Erikson’s stages of psychosocial development, do a quick review, and do a mental assessment of myself, to make sure I understand where I’m at and what I’d like to accomplish in life, so that I don’t get frustrated with myself or where things are going. Writing this birthday post is a great example, so I hope to write every year and more frequently in between, for as long as I can. Happy New Lunar Year! 새해 복 많이 받으세요! I was in my 2001 green CR-V, driving on the highway. Though it’s a small engine with four cylinders, it could sustain speed surprisingly well, and cruising at 80 mph was plenty fast. It handled pretty well, basically a bigger version of the Civic, for which both cars were based on the same chassis frame. I had planned on trading the car away when my mom gave me this her “old” car. She got the newer CR-V. But I ended up keeping it, since it’s serving its purpose well—driving all over the Bay Area, enduring harsh bumps and puffing up hills in San Francisco, and to date, it’s never left me stranded alone on the highway. Yuka, my wife, was sitting in the passenger seat. Outside the car was one of these classic days with a clear blue sky, temperature was literally perfect, at 68 f and felt warmer if you’re inside the car, with sunshine rays hitting against the glass. Few luxury cars passed us, then couple American muscle cars like a Corvette or Charger with Hemi V-8 engine would sneak out of nowhere and speed past them and us, as to say look who’s the boss here. Out on the road, I’d play a little mind game and try to identify which models they were, the years they were, and sometimes, I’d try to see who was behind the wheel, whether if it’s male or female, and made a bad stereo-typing. I turned my head around, only to find that my wife wasn’t doing any of what I was doing—cars spotting, stereo-typing, or enjoying scenery out front. She was just looking at me like I was doing some kind of a commercial or in a movie. Yes, looking at me, nothing else. Realizing this, I made a little facial expression as to say “Yes? were you gonna say something?” She shook her head and said “I was just looking at you. That’s all.” This made me a bit self-conscious like was there something on my face or under my nose. I quickly checked myself in the front view mirror; nothing going on my face. Then, I said “So, you were just looking at me. Not interested in these cars much fancier than this green CR-V or the nice weather outside?” She responded “No, just you.” and she smiled at me. I made a small grin, turned my head back and to the road ahead. I could feel she was still looking at me. It’s hard to imagine I’d make a more interesting subject than these cars like Tesla Model S, GTR, Porsche 911s (my future dream car), or the likes. Then I felt her hand coming over and hold my hand. The CR-V kept up at 80 mph yet still few luxury cars passed us, then a Corvette or Charger roared past all of us. But I know she wasn’t paying attention to any of them and I dream of us in a Porsche someday. Today didn’t go so well for both Yuka and I. Yet I was surprised at myself for not getting so ballistic over what had transpired. We had a plane flight early at 6:30 am with Southwest Airlines. We woke up super early at 3:30 am in the wee morning, all red-eyed, got ready, waited and waited for Super Shuttle van to come pick us up, at around 4:15 am, except the van never came. So, I had to get my iPad and called Super Shuttle via VRS. I finally got on a call with a live rep. and told her about our situation. She said that all Shuttle van drivers are occupied and wouldn’t be able to get us picked up. WTF is this?, I thought. Instead, she’ll call a cab driver to come get us, at no extra charges. Ok fine, I said. The cab driver came rather quickly; I thought it’d be much later even we had lost significant amount of time waiting for Super Shuttle anyways. I was getting worried about not having enough time getting to the airport, and sure enough, by the time we got there, there were lines of people waiting as if it was an amusement park, these kind of lines that take an hour or longer. You just knew. 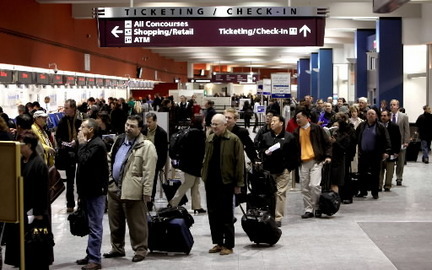 I must admit—I underestimated the situation that there’d be fewer people at the airport but no. Acting on my survival instincts, I tried to look for a shorter line or something, and then saw a Southwest rep agent who was standing near the long lines and it looked like she was helping monitor or direct people to the lines. I walked to her and showed her our flight itinerary, hoping perhaps she’d sympathize and get us bypass the line. She looked at it and told us we can wait here and she’d get the tickets for us. She got back to us with our tickets but told us we’d have to wait in the line behind other people to check in our bags. Great, no such luck, I thought. It took us a good half hour before we finally got to the front desk and checked in our bags. We quickly went up to the upper floor and saw that security line was also full of passengers too. That’s when I knew we may not be able to make it to the gate and it took almost another 25 mins before we could get through the security line and we walked as fast as we could to get to the plane gate but the doors had gotten closed. It was 6:25 am. The plane was due to depart at 6:30 am, so I was kinda surprised it’d leave that sharp. Usually, it’d take few more minutes before it undocks from the gate for good. I suspect the plane was already full so they closed the doors sooner than usual. So, we had to go to a tickets booth again to reschedule our flights but all flights were full till the next day. FML. Naturally, I was disappointed at myself for letting this down and missing the flight, like maybe we should have left sooner, but it all started with Super Shuttle not picking us up and not anticipating the rush hours at both heavy lines at the airport. Those just ate up time. I guess we’ll use Lyft or Uber next time. Despite the whole thing, I noticed I wasn’t as let down as I thought I’d be. One lost day. Perhaps that’s because I have someone now at my side, my wife. As we were walking back to head out of airport, I saw a Mexican tacos shop that was opening for breakfast and thought it’d be nice to get breakfast burrito. My stomach seemed to agree and make grumbling sounds. My wife seemed to read my mind and said she wanted to get some Starbucks coffee. Then, I realized we’re on xmas vacation after all, as I stepped into another line for my burrito. If you had to ask who is Dexter, then you probably haven’t heard of TV drama show named Dexter. I have a friend who’s pretty much a film buff himself. He’s like Ebert except he doesn’t do movie reviews in writing but in ASL discussions. From time to time, we’d bring up movie/TV shows conversations and talk about these plots, meanings, acting or how bad these were. The conversation came to Dexter and he was telling me how good it was. Finally, I got to watch the drama and it took me longer that I’d expected to finish all of the episodes (8 seasons, 96 episodes). Well, you can read all about Dexter on Wikipedia or movies stackexchange forum to get a broad idea of what Dexter TV show is all about. In a nutcase, it’s about a guy who is a serial killer himself yet he works as a blood splatter analyst in forensics and homicide investigations. That’s the “hook” this TV show drama has and the guy carried the TV show like no one else’s business. He does a good job of being cold to people around him like if you needed to talk to him, he’d tell you he has somewhere to go to and that he’d talk to you later. He has that impression about him yet he remains invested in what’s going on and would be able to give you advice, as long as you’re not in his way or a threat to him. In many ways, it reminds me of another TV show and more well-known at that—Breaking Bad and Walter White. We see his transformation from teaching chemistry to high school students to the mad scientist that he’s become, with the best meth not just in town but in the whole nation, and with his new ideals that justify his actions and the purpose in making meth and ultimately, money and security. We see similar transformation with Dexter and he was convinced at first that he was born a serial killer because of his unimaginable trauma of witnessing his mother getting murdered cold-blooded. Apparently, he thought he was destined to be one, after what had happened to his mother and to himself too, enabling him to be a serial killer. So, he’s trained himself to be one and in controlling his ever urges to kill someone, his father taught him the code, in which he acts as a vigilante to kill others who have committed murder themselves and that gives Dexter a sense of justice while appeasing his urges to kill. That’s the idea of the code. 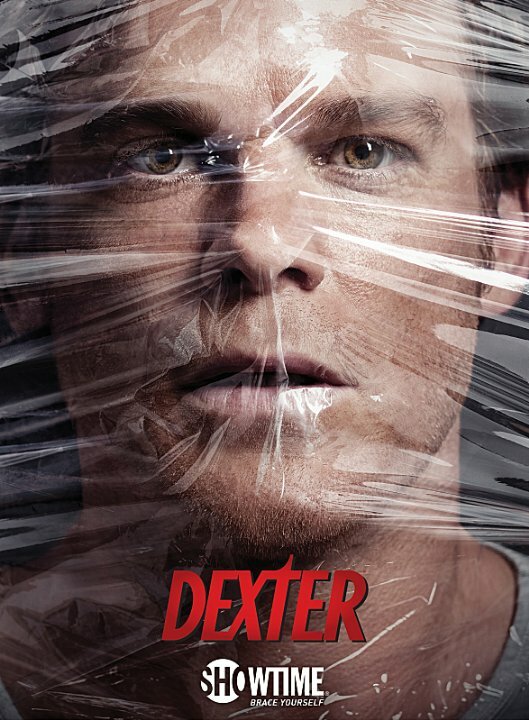 However, over time and through episodes, Dexter learns more about himself and what it really means to be a serial killer, and naturally, fatal mistakes that he’s made. It took a long while before he realized he can stop being one but of course, just one more killing he needed to do, then he’d be all done with that business, as he seeks to wrap up things for good. That came with a dearly cost and a tragedy. The TV drama finally came to a bizarre ending and it looks like he’s not done yet and perhaps, he’s born to be a serial killer. 100 Notable Books of 2014 by NYTimes. Looks like I’ve got some reading to catch up. Maybe 10 of them.